While interning in New York this summer, I made it my priority to visit a lot of museums during my time in the city. Originally from the Chicago area and now finishing up my degree in Washington D.C., I had never lived in New York for an extended time period-but museums have always been at the top of my list when visiting. As an intern at Cooper Hewitt, Smithsonian Design Museum, I not only worked at a museum with amazing exhibitions, but was also steps away from other fantastic museums. 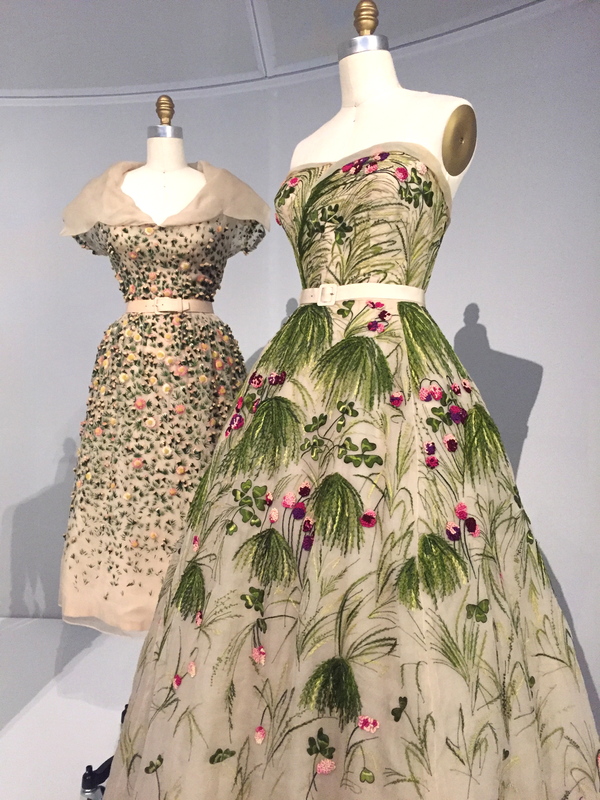 Dresses in top photo: Christian Dior, “Vilmiron” Dress (1952), and Christian Dior, “May” Dress (1953). One of the exhibitions I was most looking forward to seeing while in New York was the highly anticipated “Manus X Machina: Fashion in An Age of Technology,” the summer exhibition at the Metropolitan Museum of Art’s Costume Institute. The Met’s Costume Institute exhibitions are known for attracting huge crowds. During both of the two visits I made in July, it felt like there was a huge event going on but that is the nature of the excitement that surrounds the exhibitions. Ben Davis, a critic with Artnet, included a graph that shows the top performing exhibitions of the Costume Institute for visitor attendance (below). To me, and I am sure to many other visitors, the exhibition felt magical. Although I would not consider myself the most fashion-forward person in any sense, I have always found fashion to be mesmerizing and have always enjoyed pouring over the pages of magazines such as Vogue and Vanity Fair. “Manus X Machina: Fashion in an Age of Technology” presented pieces that were both made by hand and by machine, showing how both techniques are important to the future of design. I could see how even the most simple of technologies could change a piece. The amount of detail in every piece in the exhibition was stunning and the variety of materials showcased was notable. Giambattista Valli dress on the right. Love the texture and material in these dresses. The show-stopping piece at the center of the exhibition designed by Karl Lagerfeld for Chanel. If you have not visited the Met’s Costume Institute, or for those of you who have and simply want more, I would highly recommend viewing the documentary, “The First Monday in May,” directed by Andrew Rossi. This is without a doubt one of my favorite documentaries. I went to see it a couple weeks after it was released in theaters in the spring. The film follows the curatorial process of the Met’s 2015 Costume Institute exhibition, “China: Through the Looking Glass” and the planning process for the Met Gala. I think my jaw was wide open as I watched the entire film. For anyone who loves museums or fashion, it is a must-see. The Met recently announced the Costume Institute’s next big exhibition that will feature designer Rei Kawakubo, founder of the label Comme des Garçons. For a good analysis of that announcement, take a look at this piece by Vanessa Friedman. These photos were amazing and I liked the fact that it was all of your own photography. I was really able to feel like I was almost at the exhibits and it was good to hear your take on all of it. I liked how you bolded some of the text in your post and embedded the Vogue trailer at the end, it was a good closing to the post. I love fashion exhibits at museums, I always think that you can see so much about history and about people through the clothes that they wore. Looking forward to reading more! Hi Lillianna, thanks for all the feedback and glad you enjoyed the photos!